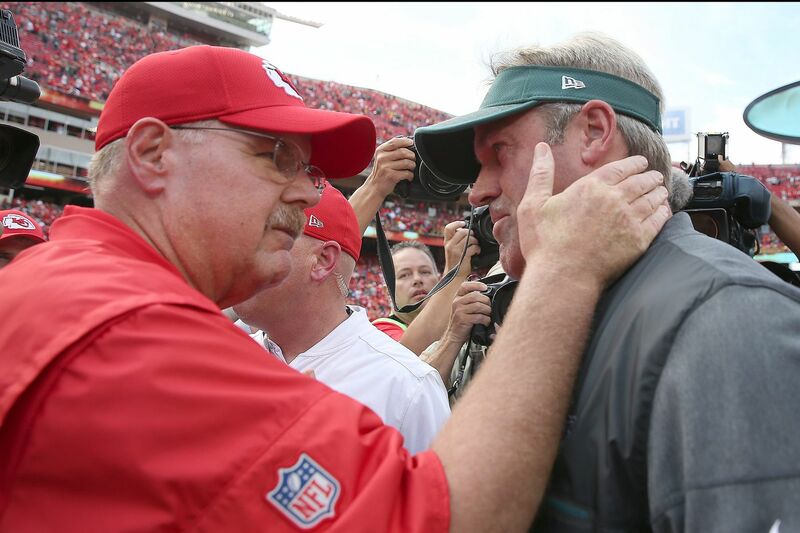 Which coach would you choose: Andy Reid (left) or Doug Pederson? Under Coach No. 1, the Eagles will win the Super Bowl once. Of this, there is no dispute; we will stipulate it as a condition of this exercise. If you hire this man, your favorite team is guaranteed to be the last one standing and celebrating when the confetti flutters from the (domed?) sky on the first Sunday night in February. There will be a parade and the months-long afterglow. There will be an Eagles player, resplendent in Mummers purple and green, chugging down beers and screaming like a Scottish warrior. There will be catchy applause lines during the post-parade speeches that stroke your collective civic ego: You are the best fans in the world, and it doesn't matter whether anyone likes you. In fact, it's preferable that no one likes you, because you're champions and you can tell everyone who isn't from Philadelphia to stick it. The satisfaction and self-righteousness will wash over you like a warm, cleansing shower. But here's the catch: Under Coach No. 1, you will win just that one Super Bowl, no more, no less, and the years surrounding that championship run will be barren, a succession of 7-9 and 6-10 seasons that offer no opportunity to relive the ecstasy of that remarkable moment. Your Sundays will become glum and passionless. The only upshot will be that your house will be beautiful, because you'll have plenty of time to rake leaves and shovel snow. How else will you pass the time after the joy has faded and the hope is gone? Now, let's consider Coach No. 2. By virtually any measure, Coach No. 2 is the better, more accomplished coach. He has won more games over more years than Coach No. 1, and he has excelled despite the changes to and evolution of professional football. Actually, he's been at the vanguard of that evolution. He is one of the most influential, innovative offensive minds of his generation. No one better prepares his teams for the attritional nature of a 16-game NFL season, and no one better develops quarterbacks: Under his direction, mediocre quarterbacks become good quarterbacks, and talented quarterbacks become marvelous. His teams are reliable playoff and championship contenders, and if you hire him, your team will be a playoff and championship contender every year, too. You can pretty much guarantee it. Andy Reid spent 14 seasons as the Eagles head coach. What you can't guarantee, though, is that your team will win the Super Bowl with Coach No. 2. That's the hangup, the hesitation, if you go with him. Your team will always be in the mix. Every season will be a fun ride, and you'll be along for it, and you'll carry that precious optimism and promise into every January. Maybe, finally, this will be the year. But with Coach No. 2, this year might never be the year. There is something in what he does or how he does it that just might prevent him from ever winning a Super Bowl. It sounds mystical and illogical, but that doesn't mean it's not true. If you hire Coach No. 2, yes, you might win a Super Bowl. You might. But consider the alternative: You might suffer through a decade or more of unparalleled frustration, an infuriating annual tradition of coming close, of reaching out but never touching gold. At 4:25 p.m. Sunday at the Superdome, the Eagles – who are 4-5, who are the defending Super Bowl champions, and who are coached by Doug Pederson – will play the New Orleans Saints. The Saints are 8-1, and they have been stomping all comers for weeks now, and if they win Sunday, they will probably stamp out the last flickering ember of hope that Eagles fans have that their favorite team might yet salvage its season. Those glum Sundays will seem that much closer. At 8:15 p.m. Monday at the Coliseum in Los Angeles, the Kansas City Chiefs – who are 9-1, who have not won a Super Bowl since January 1970, who have won one playoff game in the last quarter-century, and who are coached by Andy Reid – will play the Rams. The Rams are 9-1, too, and this game could be a preview of Super Bowl LIII. Reid vs. Sean McVay. Patrick Mahomes vs. Jared Goff. It should be thrilling. So, do you choose the Pederson scenario or the Reid scenario? Of course there are caveats. Of course there are. Pederson might win another Super Bowl. Reid might win three or four with Mahomes. You might be 73. You might have been waiting 57 years for another Eagles championship, and you might trade a few more years of blah for that one season of HolycowIstillcan'tbelievetheyranPhillySpecialonfourthandgoal. You might take Pederson. You might be 23, early in your fanhood. You might be curious what Reid's 14 seasons as the Eagles' head coach were really like, and, based on what he's done with Mahomes and the Chiefs offense, you might chalk up those 14 seasons without a Super Bowl to a long and unlikely bout of bad luck. You might take Reid. Me, I'm 43. I'd take the longer ride, without any guarantees. Just be sure to ask me again in 30 years.